Kimball Hall at the University of Maine at Machias is one of the properties that the University of Maine System Board of Trustees has given the OK to sell, repair or demolish. ORONO, Maine — The University of Maine System Board of Trustees on Monday gave campus leaders the go-ahead to dispose of properties scattered across the state as part of the system’s ongoing efforts to downsize. Recent independent reviews by Sightlines, a Connecticut-based facilities consultant, found UMS has more space than it needs, some of its buildings are underused, and much of its square footage is old and in serious need of costly repairs that, in some cases, might not be worth the investment. One of the properties the system hopes to sell off is its office space in downtown Bangor, which UMS officials and employees have called home since 2005. About 100 system employees would relocate to other locations on campuses. The details of that plan are still in the works as part of Chancellor James Page’s One University initiative. The University of Maine System offices, which are known as Unit 2 in the historic downtown Grant building, are valued at just over $1 million, according to the city assessor. The system spends about $141,000 per year operating the building. In Portland, the system could sell several buildings on the perimeter of the University of Southern Maine campus. Other options could be on the table as well, including demolition, leasing or repurposing. The “white houses,” as they’re commonly known, are a series of former residential buildings, located on Chamberlain Avenue, Deering Avenue and Granite Street, that were converted into University of Maine System office space. University of Southern Maine officials have expressed an interest in holding onto the land, even if the buildings are leased to other groups or torn down. 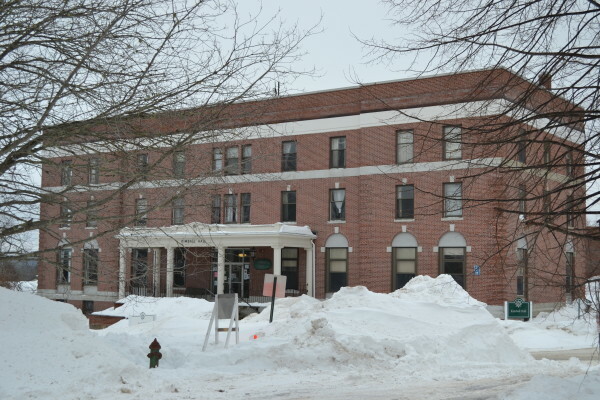 Last month, the University of Maine at Machias evacuated and closed Kimball Hall because of structural concerns after a “facility assessment” found that portions of the exterior brick walls might fail because of years of deterioration. That building could be sold, repaired or demolished depending on the extent of the damage and whether the university could adapt and shuffle staff to other locations on campus. Kimball Hall houses faculty offices, The Galley dining area, student gathering spaces and the UMaine Machias Facilities Division. Chip Gavin, UMS director of facilities management and general services, has said it could cost up to $4.5 million to complete the backlog of renovations needed at Kimball Hall. Demolition would carry its own costs as well. Ron Mosley, a business and law professor at the University of Maine at Machias, was displaced from his office in Kimball Hall when officials shuttered it due to concerns about the building’s structural integrity. He said his office is now in a campus dormitory. He called the Kimball Hall shutdown a “wakeup call for all of us.” Mosley argued that the deteriorating condition of that building and others in the system are a symptom of ongoing budgetary issues and lack of funding to tackle deferred maintenance. Finally, the board gave the OK to pursue the sale of a 30-acre piece of undeveloped land along Stillwater Avenue in Old Town, next to the elementary school. That property includes a small portion of the DeMeritt Forest. The property could have commercial value, as an auto shop and Dairy Queen are across the road.